I have always loved books, and have been writing reviews for publication since 1966 when I was the editor of The Villanovan, the Villanova University newspaper in the US. I was also the literary editor of The Australian in the early 1980s for two years, and have reviewed books for decades. I am only mentioning this because the review below was written for the Returned and Services League (RSL) magazine, Reveille, edited by John Gatfield. I worked with John at Channel Nine and Sky News, and he asked me to review the book (it was pro bono). I did and he was happy with it. James Brown, the NSW President of the RSL (and son-in-law of the Prime Minister, Malcolm Turnbull), ordered the review to be deleted. Why? John said: “He had no desire to do me any favours.” John Gatfield is no longer editor of Reveille. James Brown decided he didn’t want Reveille published by Acumen Publishing, which John and Richard Landels had been doing for nearly 20 years. It is an inspirational book, an excellent gift for veterans and their friends and families this Anzac Day. The editor of this book of war stories says in his introduction: “My father never talked about his service or experiences in World War II.” Neither did my Dad, who was in the US Navy on supply ships off famous Pacific battlegrounds like Saipan and Iwo Jima. John Gatfield’s father served as a gunner in the Middle East with the NZ Army Field Artillery. Both had, I’m sure, marvellous stories to tell. They would love the 75 yarns written by ordinary Australians, many of whom performed extraordinary feats during the Second World War, from their courageous days as prisoners of war in Changi and the Burma Railway, to the battle of El Alamein (Featured photo above) which turned the tide for the Allies in 1942, to New Guinea and the Kokoda Track where the Diggers fought with dogged determination. 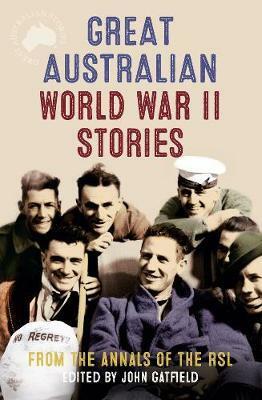 These Australian World War II stories are personal and poignant. There is not a sniff of elitism: the Diggers are down to earth, the brave prisoners endure hell, and the men and women we read about care more for their mates than themselves. This is a book written by and for returned servicemen and women, for their families and friends and for all Australians. Lest we forget. I’m confused. Why did John Brown not want to do you any favours? Or was it John Gatfield he didn’t want to do any favours for? Hi Tim, Sorry about that. James Brown didn’t want to do any favours for John Gatfield. That’s why John is no longer editor of Reveille! Cheers.